Our bodies are made up of over 70% water and it is involved in almost every aspect of keeping our body’s biological processes running efficiently. Not counting perspiration, it is estimated that as adults we lose about 4% of our total body weight per day in water losses. This means, it is important to replace not only this water, but also the water we lose when participating in activities, especially in the summertime. How do you know how much water you should drink? Experts vary in their recommendations and the exact amount depends upon your body weight, where you live, how much exercise you do per day, and the type of environment in which you are living. But as a general rule, one quick way you can estimate how much you should be drinking is to take your body weight in pounds and divide that number by two. The result is the number of ounces that you should be drinking per day in terms of your water consumption. For example, if you are a lady and weigh 125 pounds/2 = 62.5, you should be aiming for at least 62.5 ounces of water per day. 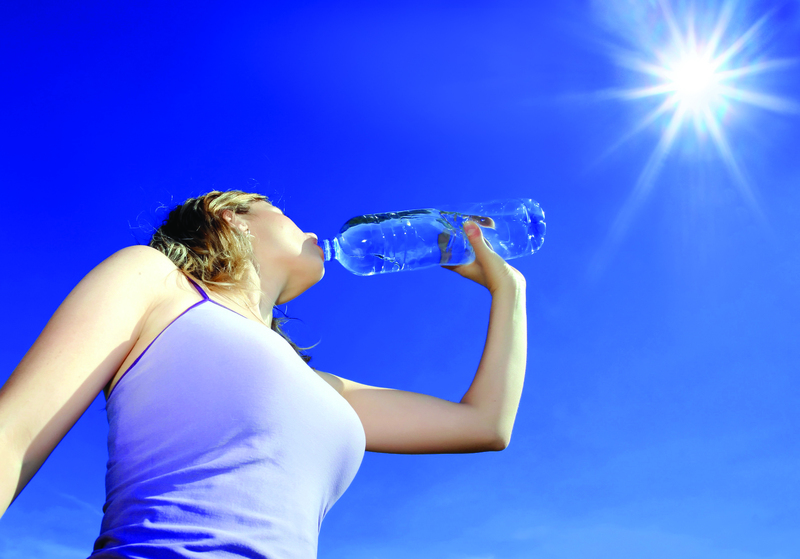 Plain water is generally the best for hydration. Avoid caffeine or alcohol as these can dehydrate you further. However, if you are working out in the heat and or perspiring extensively, then it is important to replenish the electrolytes that your body loses with either an electrolyte supplement or sports drink. If you will be outdoors or working out extensively you should drink 2-3 cups of water before your workout (about 2-3 hours prior to exercise). During your workout a good rule of thumb is to drink about 1 cup of water for every 10-15 minutes that you are working out. Sodium is actually important if you are working out heavily, so consider adding a sports drink like the low sugar version of Gatorade (the G2) or my personal favorite which is the Crystal Light Hydration Lemon which has 10 calories per a 16 ounce bottle of water, 150 mg sodium and 70mg potassium in order to replenish the electrolytes that your body loses during exercise and sweating. A good tip is to weigh yourself before and after exercise, and any weight loss immediately after exercising is the weight you will need to gain back in water. As always, consult with your doctor before beginning an exercise program and if you take any medication that may affect your fluid intake and or exercise program make sure to ask your doctor about planning the proper amount of hydration and what types of exercises are safe for you. Drink water before, during and after your workouts. Consider adding in a Sports Drink to replenish electrolytes. Confusion and weakness, and then possible organ failure can occur if the dehydration is not treated! Catherine Varchaver (Peace Corp staff: Central and Eastern Europe and Kyrgyzstan 1991–1997) spent several years on Peace Corps staff working as a desk officer, trainer and Associate Peace Corps Director for Education at Headquarters and overseas. She has worked in private practice, Body and Soul Nutrition, blending Eastern meets Western approaches to health. She received her undergraduate degree from Oberlin College, Master of Arts in Teaching from the School for International Training, certification in health and nutrition counseling from the Institute of Integrative Nutrition in NYC, and hands-on training in Chinese medicine’s 5-Element tradition working with acupuncture colleagues in the DC area.